Move the magnets and track the days; tracking the days becomes a family affair! For months I have been making countdown charts for everything you can possibly imagine. Appointments, Events, Important Dates.....you name it; we were counting down to it in our home! It was an easy way for the kids to comprehend and anticipate upcoming play dates or events (thus eliminating the "is it today mommy?! question; every day-20 times a day ;). Although this method worked in the past, my children are getting older and more aware of Days, Months, and Years, so I was on the lookout for fun Calendar that would help them learn! I found an awesome product at Learning Resources that has helped us easily transition from the countdown charts to a real Calendar! 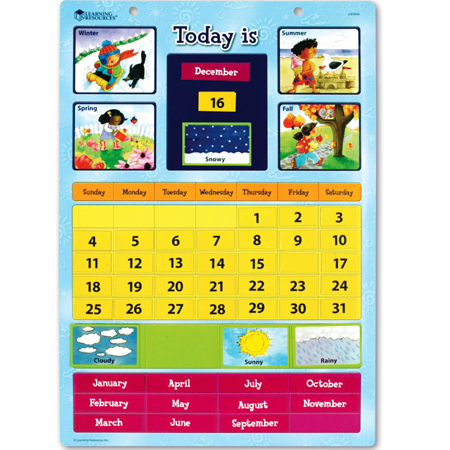 The Magnetic Learning Calendar allows you to display the month, and days, and theirs even a spot to change the current day at the top. Why stop there right?! The calendar becomes more interactive with the additional seasonal and weather magnets included in this fun kit! The kids can peek out the window in the morning and display the current weather conditions on the calender. The kids and I have had a blast with it; it's a daily activity in our house now to keep track of the month, day, weather, and season! Learning Resources is a one stop shop for learning FUN! Learning Fun! 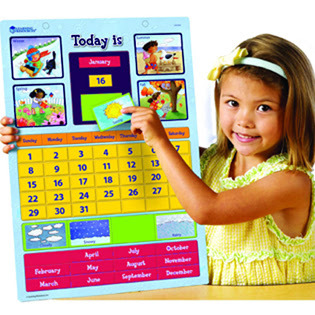 One Lucky Reader will receive a Magnetic Learning Calendar of their own! Leave a comment~ Visit the http://www.learningresources.com/ and let me know another item that you'd love to have for your child. The comment is considered your entry. I'd love to have the geosafari light writer, very cool. I'd love to have the Got It!™ Reading & Math Game for my little one too. I follow you on Twitter 1. I follow you on Twitter 2. I follow you on Twitter 3. I follow you on Twitter 4. I follow you on Twitter 5. I would also love the Snap n Learn Number Bugs, thanks! I'd like any of the skeleton's they have. What a great way to learn! I like the Smart Toss bean bag tossing game. Big Time Learning Clock is what I would be good for my child. Smart Snacks® Hide n' Peek Chocolates™ is something I'd like to have.